He's worked in some of the finest restaurants in Australia and the UK - with price tags on the food to match. 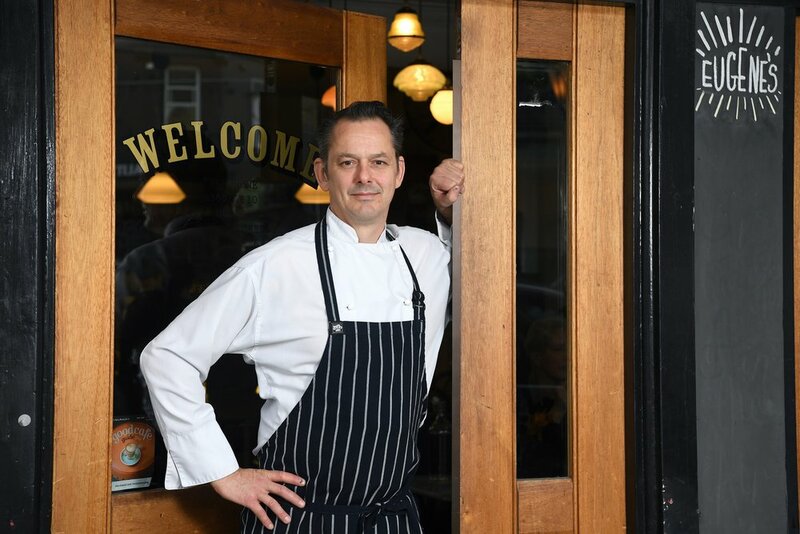 But chef Eugene Giesinger believes good food should be accessible to everyone. Using the best of techniques honed over more than 30 years in Michelin-starred and hatted restaurants, Eugene is focusing on preparing healthy and delicious take-home meals for the time challenged. From his small cafe in Sydney's eastern suburbs, Eugene is packaging fresh meals into ready-made dinners for on-the-go people, encouraged by a loyal following of patrons who've watched his Eugene's Cafe grow up. "People have seen us transform since we started out six years ago. We have some very dedicated followers," Eugene says. "I get people coming in seven or eight times a week, maybe more. They're in for coffee in the morning, they come and pick up their dinner in the afternoon." Eugene's three decades as a chef have included a stint at London's Michelin-starred Pied a Terre restaurant. He's also worked in Sydney at two-hatted Italian eatery Lucio's as well as the French La Goulue and modern-Australian Fair Go Gourmet, both with one hat. "Working in these places is really where I developed my passion for good food and, from this quite broad spectrum of culinary knowledge, I could cherry pick the techniques I wanted to use for myself." Eugene's enterprise to bring fresh food to the home - via easy, heat-and-eat meals - began when his Bronte cafe was established. He's now stepping up his quest to make tasty dinners for those who want or need a break from the kitchen. "Good food and eating well should be accessible. Delicious meals should be available at a reasonable price to everybody," he says. Eugene crafts his food around the best-quality seasonal produce and raw ingredients on the market, including sourcing organic where possible. Popular cafe dishes also available as take-home meals include Eugene's signature Tuscan-style pork and veal meatballs (gluten free), lamb shanks braised with veges and red wine (also GF), chicken curry (dairy free) and traditional English-style fish pie. Salads include Mexican-style black bean and avocado with jalapeno, lime, coriander and chicana; chickpea with char-grilled zucchini and fresh figs, pesto and bocconcini; and barley and roasted carrot with corn, roasted fennel and toasted almonds. Meals are made onsite, only about 40 portions at a time, and vacuum sealed. "We're a small-batch operation with a high turnover, so it's always fresh," Eugene says. "There are no chemical preservatives or additives - just normal household stuff like salt or wine or vinegar. " The refrigerated shelf life is seven days (gnocchi), 10 days (veal lasagna) and 14 days (lamb tagine and meatballs). Alternatively, meals can be frozen. For desserts, choose from delights such as flourless Belgian chocolate cake, Persian almond cake with kumquat marmalade and pistachios, or burnt-butter choc-chip cookies. Eugene also makes whole quiches and sandwich platters for catering. "Life is busy. This is an opportunity for people just to open the bag, put it in a pot and heat it up." Easier still is the ability to "click and collect". For eastern suburbs' diners, orders of more than $100 attract free delivery. A flashback to when the Export Fresh team picked me as the Chef Of The Month to celebrate the creativity and hard work of Australia's chefs by using local produce and bringing dishes alive with the use of Petite Bouche leaves, edible flowers and micro herbs. At Eugene's, we avoid food fads. Our philosophy is simple: Eat real, unprocessed food, mostly plants and of the best seasonal quality. We expertly craft all of our food by hand from high-quality raw ingredients sourcing organic where possible. All of our cakes and pastries are also made by hand from butter and free range eggs. Eugene hits the Sydney markets every week at 4 am - his most significant source of inspiration for the weekly menu being the availability of seasonal produce and conversations with the providores. At Eugene's, we are many things: your local cafe serving fantastic espresso coffee and a la carte menu, your local food store supplying take-home dinners & ever-changing salads to Bronte's families, and a space to be inspired by food - always loving what you eat.